This fully adjustable head harness with high density polyethylene shell. 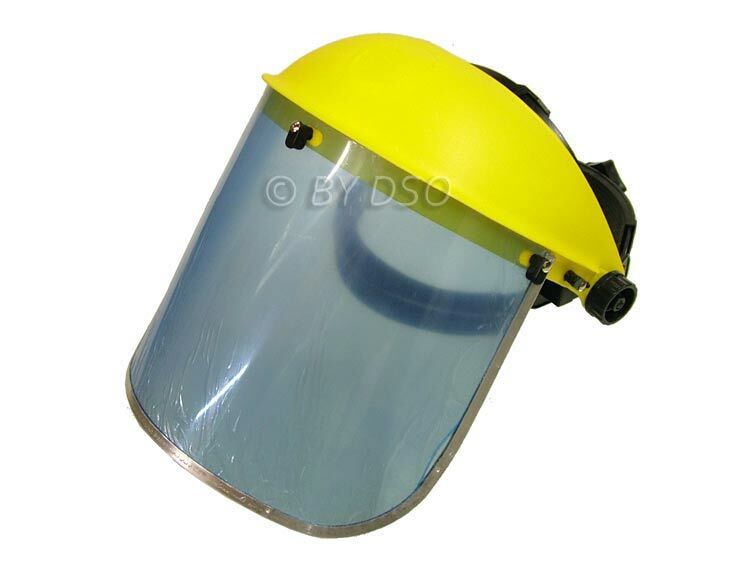 Clear polycarbonate visor is a great way to protect you from flying sparks and particles while you work. A must have when working with chainsaws, pressure washers, grinding metal, mixing chemicals and working with wood working machines. The list is endless. You only have one set of eyes. Better to have one and not need it, than need one and not have it. Bright yellow and fully adjustable with comfort head band, Be seen and be safe. This lightweight face shield and visor comes with a padded headband and single point ratchet for safety and comfort. It also has an adjustable headband so you can get good firm grip on any head size and a convenient flip up visor. Comes supplied in simple to assemble components and the visor has easy to remove protective films. The lens is clear and not blue as it appears in the pictures. This is a blue protective film that will need to be removed before use. Designed to be used in all types of industries. At work or at home using chainsaws, pressure washers, grinding metal, mixing chemicals and working with wood working machines. Adjustable headband to get a snug fit on any head size. One size fits all.